So after the sarcasm fire of my last review, I need to applaud that this book ostensibly written for young adults had a more realistic picture of romantic relationships than The Glass Ocean – a more “literary” historical fiction – did. Our hero Cath develops relationships that are more complex than “buhh I luhh him,” in ways that are recognizable to actual humans. (Can not stand books that insist that a character loves another without showing the reader why they are. Beauty is not a character trait.) Her non-relationship with high school boyfriend Abel continues out of momentum and conflict avoidance – there’s no reason to break up, so who cares that there’s no reason to stay together? She develops a crush on a classmate due to shared interests and a mutual love of writing, which they do well together. She begrudgingly comes to love her roommate and her boyfriend despite her social awkwardness and their initial teasing. She has difficulty with her twin asserting independence, in part because said twin makes some questionable life choices in the doing. Rowell writes these characters and relationships effortlessly – these are people wonderful in their flaws. And I haven’t even touched the fan fiction. Cath’s real relationship until the above interpersonal ties blossom is with Simon Snow and his nemesis roommate Basil, fictional magicians she writes fan fiction about. 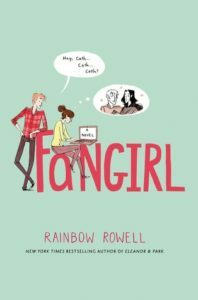 I read “her” fan fiction first – Rowell’s book Carry On was a spin off from this one – and I can’t remember loving a book so quickly or thoroughly in recent memory. It made it easy to understand how Cath could reject the real world for that fictional one as it was utterly charming. Rowell never demeans Cath for her escapism though; her relationship with her fictional world is never diminished for being fictional. Even as it’s shown to be something of a coping mechanism, Cath’s retreat into fiction she can control is both understandable and healthier than the drinking, flirting, and disengagement, and abdication of responsibility of her friends and relatives. I loved it. Read the damn book. I haven’t read this yet, but I’m pretty sure I’ll read all of Rowell’s books in my life time. Each one has delighted me so far! Agreed! So far Carry On has been my favorite but they’re all amazing. I really noticed the complicated relationships on my last read through a couple of months ago, too. It’s where the meat of the story is, and authors who can’t do that really miss out on a lot of depth. I also really appreciate that the relationships weren’t diminished because of the characters’ ages. You can have complex relationships even at 20. This is my favorite Rowell book. I don’t like most of her stuff, but this one was such a treat. The characters are so well-drawn and it’s just the right amount of earnest. I love Carry On so very much, but after re-reading it recently, the first section, before Baz actually shows up, does drag quite a bit and I wish there would have been more Simon and Baz together. Fangirl is pretty much perfection to me, and I find more things to love about it every time I re-read it. I think it’s retaken the top spot from Carry On. Very excited to see where Wayward Son will rank – all of Rowell’s books are among my favourite books of all time, so even if it’s her worst one yet (perish the thought! ), it’ll probably be amazing. I haven’t read Carry On yet, but I think I’m going to buy it and Wayward Son just because I want the two titles next to each other on my shelf. Yes, everyone should read this damn book. Rowell is at the heights of her powers here, with characterization and interpersonal dynamics. I’ll be digging into Carry On this year, finally. I couldn’t bear to read i until there was more published Rowell in the world. Although I’ll probably blow through it, Wayward Son, and Pumpkinheads all this year. I reread all of her books last year, and this one gets better and better with every reading. If you’ve ever had the chance to see her talk in person, she tells stories about how she and Cath are so similar — IRL, Rainbow switched high schools because she didn’t know how the cafeteria worked. I love her so much for making her personal anxieties so acceptable and relatable. I may have just bought a book for its cover, title, and Rowell blurb. Of the three Rowell books I’ve read(ATTACHMENTS, ELEANOR & PARK, and FANGIRL), FANGIRL is definitely my least favorite. I thought it dragged and Cath was annoying. Levi is the only thing I really liked about this book.